Hodge helps me sew up the seam on the last tree. April has gone by in a blur. I couldn’t tell you where the time went. My full-time job has been keeping me so busy that I am surprised when I have the energy to work on the blog or the book in the evenings. I have a feeling I will need to take some time off this summer to get all my squirrels in a row. 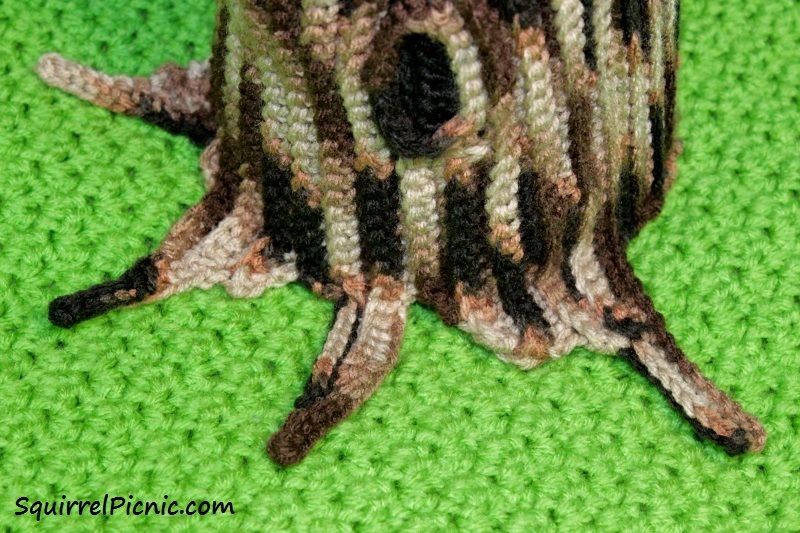 I played with freeform crochet to create the exposed roots on the trees. This month – in the car, on the bus, in parks, and mostly on weekends – I concentrated on finishing up the set and creating the first new pattern for the book. For the set, it was all about trees, which I made from Red Heart Super Saver yarn in Platoon – a variegated yarn in the perfect tree bark colors. I crocheted the trunk on each one with single crochet stitches through the back loops only. That is what gives it its ridged texture. I created the little hole in the trunk by crocheting a flat oval in black and then crocheting around it as I was working on the trunk. I really enjoyed making the tree’s exposed roots and am still amazed at all the texture you can create with variegated yarn. It was so neat how the colors magically worked together. I just tried to step back and not interfere too much – I was afraid that if I edited how the colors were laying out on their own, it would end up looking overworked. I’m really pleased at the natural patterns that were created in the bark. The larger tree is formed around a floral cone. When I was done crocheting the trunk, I joined the ends into a tube and inserted a foam cone to give it a solid form that would help it stand. 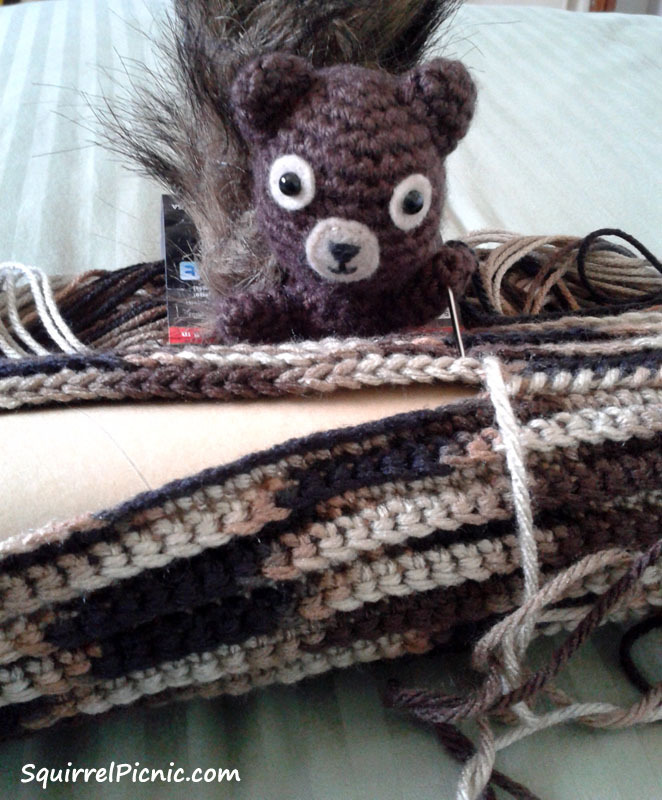 I worked Fiberfill stuffing into any empty spaces and played with it a bit till I got the shape I was looking for. Then I threaded a length of yarn through the stitches at the top and pulled it tight to close it. After this main tree trunk, I made another, skinnier tree that will be placed at the back of the set. Seeing these two together, I wonder if the background looks a little barren. I might whip up some bushes to fill it in a bit. What do you think? There are also a few details like knots and tiny branches that I still want to add to each trunk. You’ll have to join me over on Instagram this month to see the final trees. 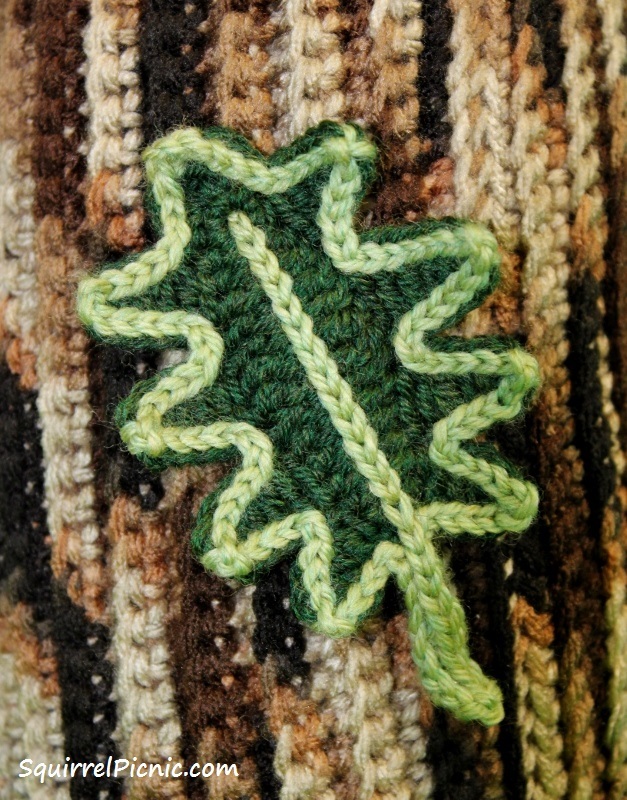 The other big task in April was to create an oak leaf pattern and crank out as many oak leaves as I can. I used a gift card my brother gave me for Christmas to get the Cascade 220 Superwash in Shire and Celery for these leaves. It is so cuddly and divine. I’m going to need a lot of leaves to create the frame for the cover of the book and for the trees, of course. We want them to look happy and leafy. Podge and I love to work outside. 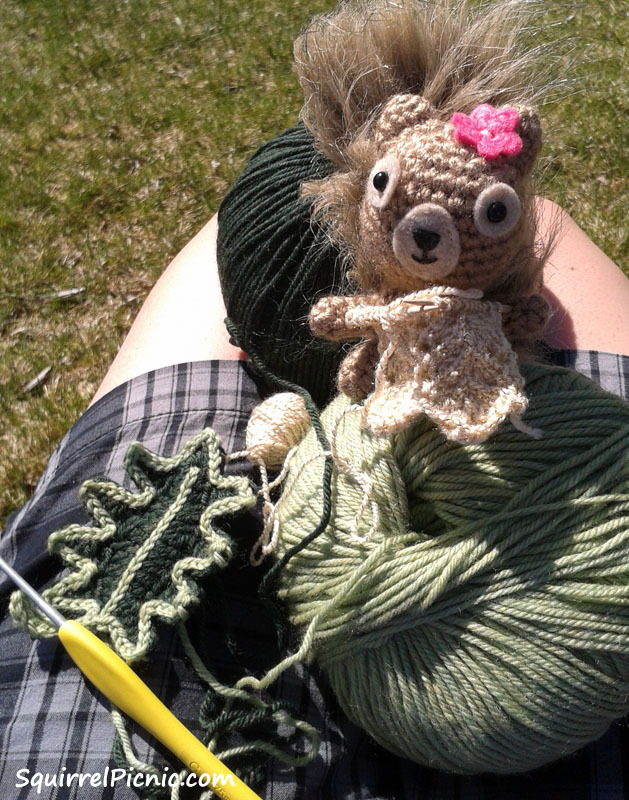 Here, she knits a table runner while I work on leaves. I’m thinking that after I have used them in the story, I will connect all the leaves to make a bag or a pillow or a place mat. Whichever I choose, I will be sure to include instructions for it in the book! I also met with the artist, my dear friend Sylvie, who will be doing the layout and illustrations. I am so incredibly grateful for her talent and her guidance. She was quick to advise me that we should start working on the cover as soon as possible, so that is what I will be doing through May – starting with finishing all those leaves! I know that having a cover will be an inspirational touchstone to me throughout the rest of this year. And I can’t wait to show it off to you! 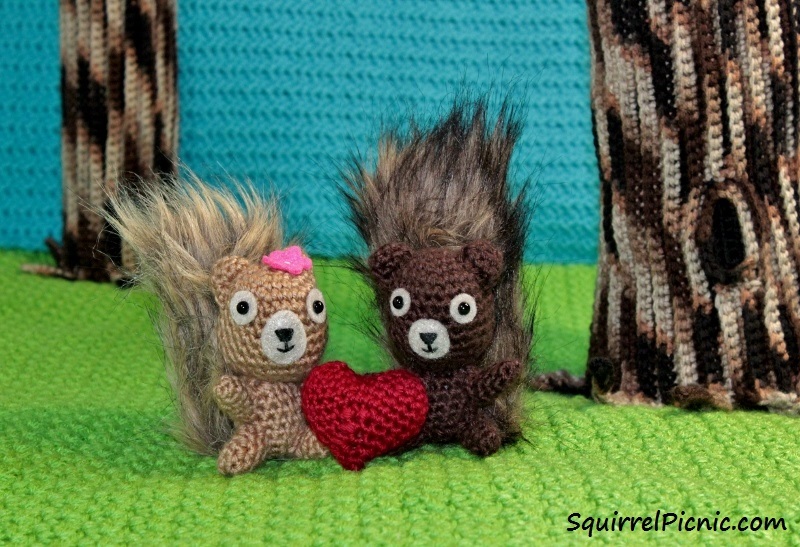 Categories: Hodge & Podge, SQUIRREL PICNIC (the book) | Tags: amigurumi, big acorn book, crafts, crochet, diy, pattern | Permalink. The tree AND the leaves look terrific. Nobody knows how much work designers go through to make something special. That is why I REFUSE to make free patterns. I do not need the money right now because I do have full-time job also, but I give the money away, because other people have need. I am so looking forward to this book. Much love to you. Thanks for sharing this, Beate! 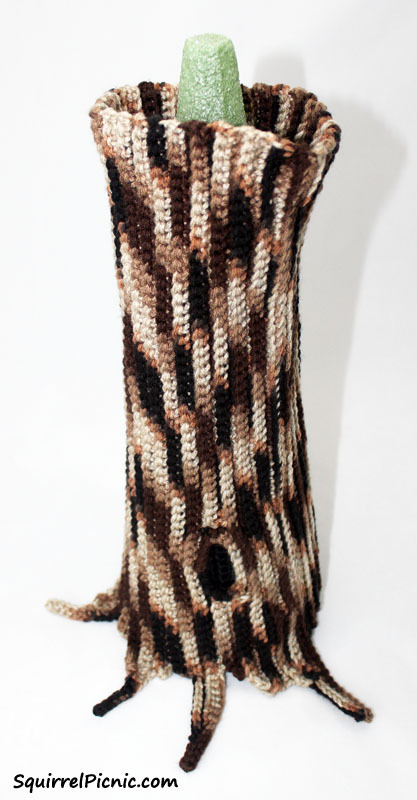 After several years of publishing free patterns, I am starting to feel the same way. That’s why it’s always so nice to hear from people like you who understand the labor of love that goes into this work. Especially because of Hodge and Podge, I am hoping that the storybook/pattern book form will provide the perfect niche for publishing my patterns. I have never have done free patterns. I just do not want to draw that crowd. Every person “deserves ” recognition and compensation. I donate my pattern money, because I do not need it. This way others have the benefit of my work. If I can help you with publicising, please e-mail me. I have a huge social media following. Except for Twitter. I got hacked twice. It’s so helpful to hear your story. Thank you for everything you do for the crochet community. It’s so generous of you to donate your pattern money. I agree about free patterns to a certain extent. I know that my patterns have helped a lot of people, especially mothers, to make inexpensive toys for their children. And that makes me happy. But at the same time, it will be nice to be compensated. Both profit and philanthropy have their place, but either way, it’s important to value your work. Thank you very much for your support and generosity. Great work! And it is so funny to follow you in creating your book! It will be gorgeous, no doubt about! I’m so excited!! Love the tree and the leaves! And I’m so excited for you and your book 🙂 Also, your idea for making a bag or pillow out of the leaves sounds awesome. I can picture it in my mind and I want one haha. Can’t wait to see what else you create for the set! Thanks, Patricia! I am very excited for the bag and all the fun things I’ll be making for the book. I can’t wait to show you all of them! It’s nice to know I am in good company. ❤ I love that you crochet at the park with the dogs. Isn't it wonderful to have such a portable craft? Reblogged this on The Big Acorn Race.